Oil on cardboard, 24 x 24 cm. A pale, redhead woman wearing a fashionable, shiny dress and black shawl is sitting in a pew in a church. She looks at the viewer with a reserved expression while she covers herself with her shawl. Beside her sits a black-haired woman wearing a more modest attire, supporting her head with her hands while she stares into space. 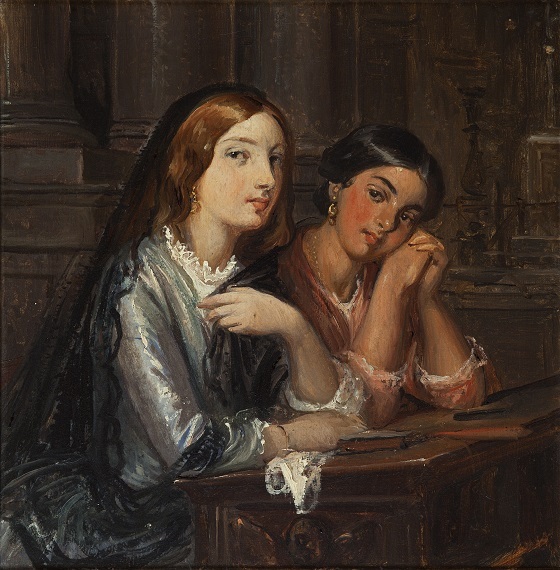 The clothing indicates that the fair-skinned girl belongs to a higher social class than her companion, who is likely from a more modest background – possibly her maid servant. When Wilhelm Marstrand arrived in Venice in 1853, it was not long before he encountered the social inequality which characterised the city. The artist sought out the poorest neighbourhoods and people and regarded them as representing a more real and honest way of life than the vain superficiality which characterised the upper classes on St. Mark’s Square. Through his Venetian subjects, Marstrand often sought to highlight the contrast between the genuine lives of the poor and the farcical world of the wealthy.